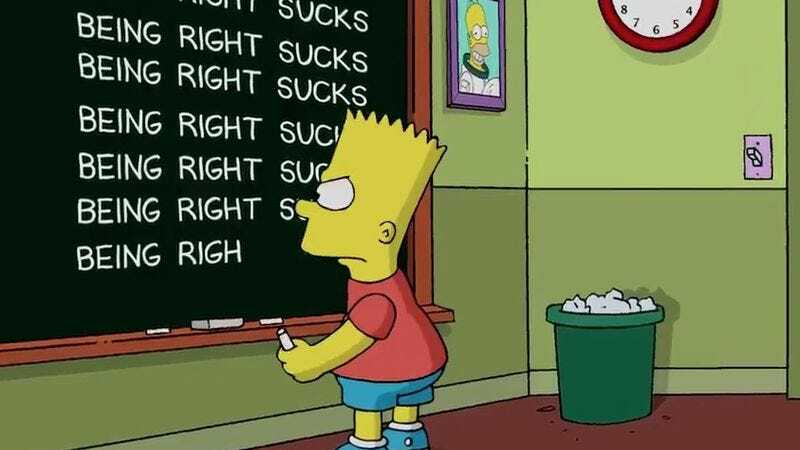 When it comes to having a throwaway gag turn into reality, The Simpsons have been on a bit of a hot streak. Last year, the show accurately predicted the mass of the Higgs boson particle (it was actually one of writer David X. Cohen’s very smart friends). Then just last month, everything was coming up Milhouse after Bengt R. Holmstrom won the Nobel Prize in Economic Sciences. But, like so many of the jokes that came after the ninth season, one has come back to haunt the writers (and half the country). As you’ve probably already guessed, it’s the “Bart To The Future” reference to a President Donald Trump who bankrupts the nation. It was good for a chuckle then, but the writers are less than thrilled about their prognosticating abilities, which is why they included this follow-up in last night’s opening. Now we just want to go back to those Satanic/Illuminati theories.